« Do Your Employees Present Like This? Ina’s speech title was “Talk with Toothpaste on Your Mind” where she cautioned us to take time to think before we communicate in family, work, and Internet situations like social networking. Great analogy using a tube of toothpaste where it’s so easy to get the toothpaste out of the tube and next to impossible to take it back and get all of the toothpaste back into the tube. This was a great example speech for potentially new Toastmasters to see and we’re looking forward to many more great speeches from Ina. 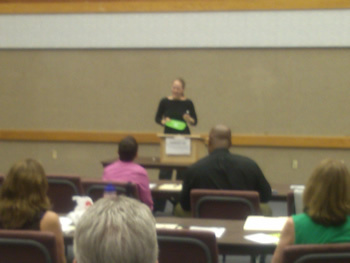 Ina joined the George Sutton Toastmasters club in March 2013 and is one of our many rising stars. Keep up the good work Ina!